The Bush administration's invasion of Iraq in early 2003 on grounds that the Saddam Hussein regime had weapons of mass destruction was a sharp pivot from the unfinished war in Afghanistan, and undoubtedly was a factor in its longevity. That second, simultaneous, war also began with wide American public support but eventually lost it too. The Iraq adventure ousted the ruling regime but also turned into a nation-building exercise in behalf of an elected but similarly contentious regime in Baghdad. In the 2008 American presidential campaign, Democratic nominee Barack Obama promised to extricate the United States from both wars. He eventually withdrew the American combat forces from Iraq but left a limited training force behind, and then began to do the same in Afghanistan. 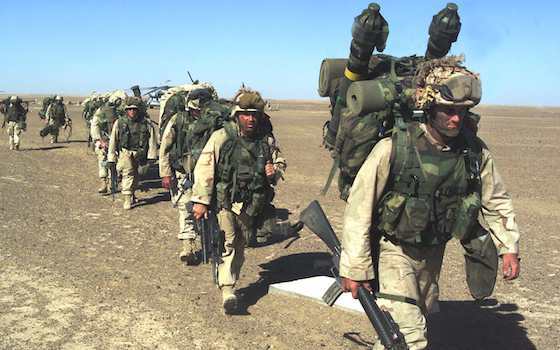 However, terrorist attacks and other violence have continued to frustrate American policy in Iraq and in Afghanistan, and that has soured what earlier had been strong support at home for both military undertakings. As the Great Recession produced dire economic consequences domestically, including high and stagnant unemployment and a shrinking middle class, these foreign adventures have taken a particular heavy toll on President Obama's approval ratings. As a result, his efforts to return American foreign policy away from the unilateral interventionism of the previous administration have become a long and frustrating slog. Obama did, however, avoid further involvement abroad with only a limited, secondary role in the ouster of Libyan strongman Moammar Gadhafi -- for which he was ridiculed as "leading from behind." More recently, Obama also stepped back from military action in Syria over the Assad regime's use of chemical weapons in the civil war there, achieving the surrender and ongoing destruction of its cache under international supervision. But the continuing fighting in Afghanistan remains a thorn in his side, as the latest poll underscores.